VPN service providers serve up regionally-restricted web contents, and protects users’ privacy and anonymity from hackers. ExpressVPN is a major player in this crowded VPN service market. There is no shortage of global sports events, e.g., the Summer Olympics, the International Champions Cup, the Ryder Cup, etc. Yet, sports fans often cannot watch these programs online because they don’t live in the broadcasters’ target countries. Even if a program is available online, say, the Summer Olympics, you may find that it shows too much local content for your liking. Perhaps, you want to watch the best athletes in action even though they are not from your own country. The solution is to sign up for a VPN service. To watch a game that is being streamed from a foreign country, you must connect to a VPN server deployed in that country. The number of countries covered by a VPN service provider ranges approximately from 20 to 200. ExpressVPN had deployed servers in 94 countries around the globe. Although that score is only middle-of-the-road for ExpressVPN, it is generally high enough for the viewing pleasure of most people. Today’s web users don’t want to be locked in to any computing platform. They want to watch sport games on their smartphones, tablets, laptops, etc. Most VPN vendors provide custom VPN client software for Android, iOS, Mac OS X, and Windows. ExpressVPN does that and more: it provides VPN clients for Linux computers as well as for Amazon Kindle Fire e-readers. For Firefox and Google Chrome the service also offers simple browser extensions. 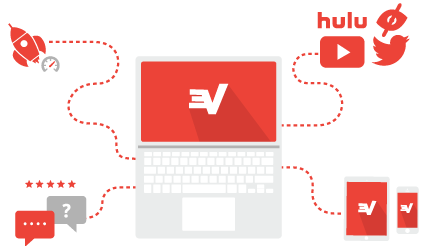 With ExpressVPN, you can watch different sports programs simultaneously on up to 3 devices. Other VPN vendors may be more generous, but three devices should be good enough for most users. When you are outside your home, you can often access the Internet using public WiFi hotspots. However, data transmission across these wireless networks is often unencrypted, hence putting your data at risk of being intercepted by hackers. This risk is mitigated by using a VPN service. All data that goes through the VPN tunnel is encrypted. Different encryption protocols offer different levels of security and encryption/decryption speed. ExpressVPN supports a good mix of encryption protocols including OpenVPN, the best all-around protocol for security and speed. The VPN client app will automatically select the best encryption protocol for your devices. This feature is very useful for the average user who may not feel comfortable to make that decision independently. Save 49% – Take 12 months and get +3 months free! ( $6.67 / month only ) Click here! ExpressVPN prices are affordable, but not the lowest in the industry. Their annual plan costs $8.32 (USD) per month. What I really like is their 30-day money-back guarantee. This is most generous because many vendors only give you 7 or 15 days. You have many choices regarding payment methods. You can pay by any major credit card. If you are into digital payments, you can pay by PayPal or even Bitcoin. Bitcoin and PayPal payments accepted. VPN clients available for many platforms including Linux & Kindle Fire. Limited to maximum 3 devices simultaneously connecting.